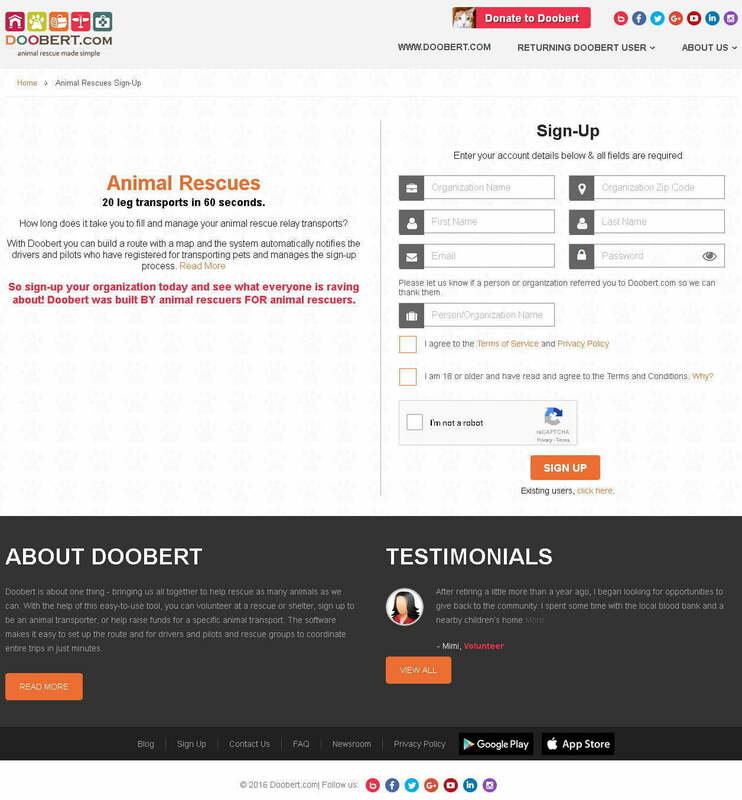 Doobert.com, founded by Chris and Daphne Roy is dedicated to providing shelters for animals. They have been doing this passion project for more than 17 years. They have their own furry family in the Midwest. Their life’s purpose is to support professional rescue teams and volunteers in their jobs. Doobert is an Web, Android and iPhone mobile app that provides a solution to make animal rescue easy, enjoyable, and efficient. Using the app helps shelters and volunteers find each other and coordinate their efforts to rescue animals in need. Has a landing page where users can download the Doobert app while using a desktop computer. Provides enough information about volunteers, animal shelters, and their rescue efforts. Include features that allow users to instantly download the Doobert app to their Android and iPhone devices. 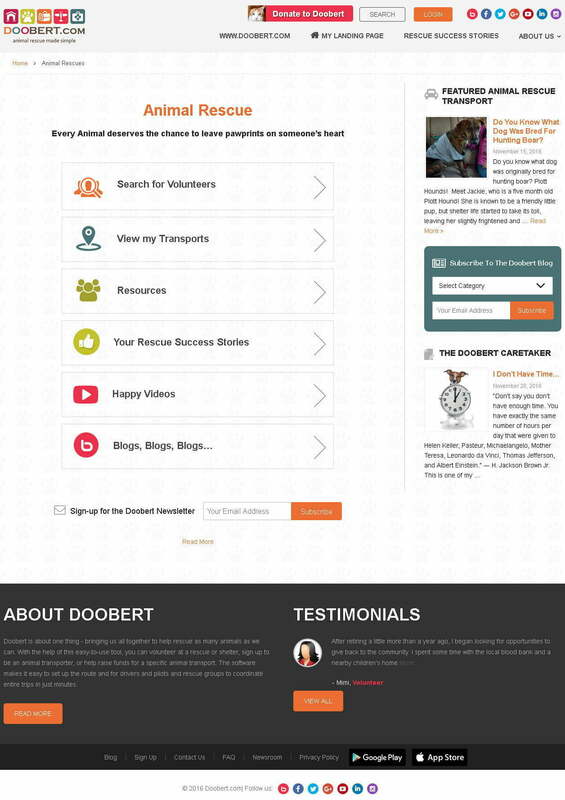 Create a website with SEO-friendly features so people can find Doobert on the web. After a thorough discussion with the client about their requirement for the mobile app and landing page, the Pulse Solutions team created a responsive website that housed all the customer’s requests. 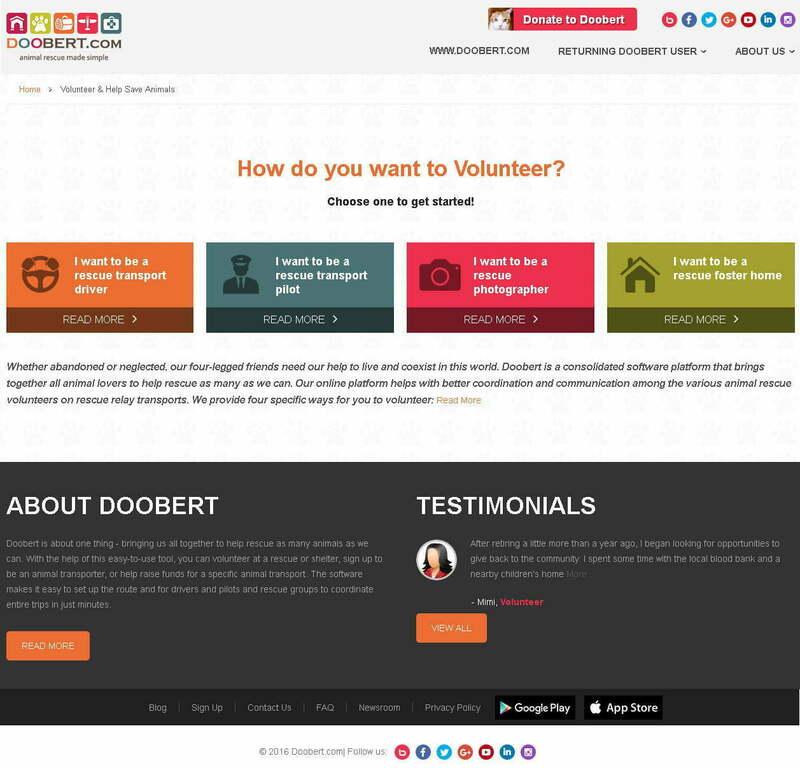 The Doobert website features success stories, resources for volunteers, and a landing page where visitors can download the Doobert app. 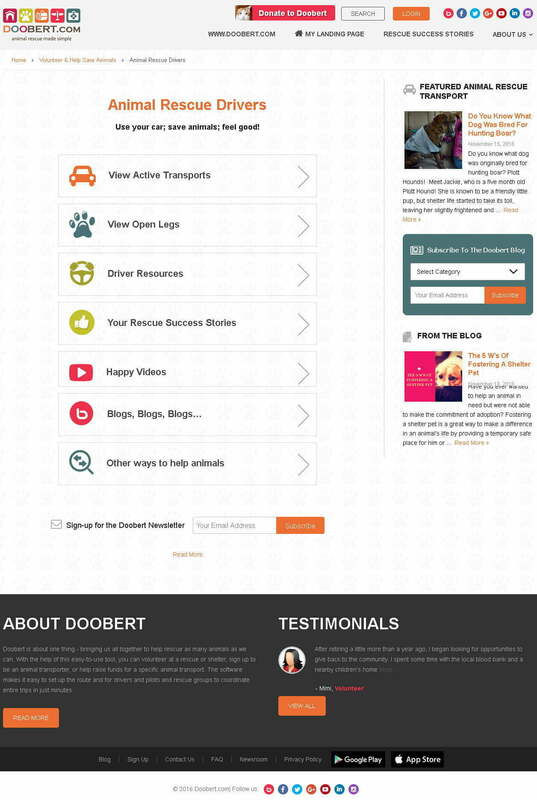 A responsive, SEO-friendly website that serves as a landing page for the Doobert app. A multi-page website that provides relevant information about the app and how people can use them for their animal rescue efforts. A responsive website that can be accessed using desktop and mobile devices. A website that has all the requested features. A remarkable rise in app downloads on both Android devices and iPhones. Users are able to conveniently download the app via desktop and simplify their volunteer efforts. Volunteer drivers can sign up using their zip code. This way, they can get alerts when a rescue relay transport is needed in their area. Rescues can take photos of animals and share them through the app so they can find a new home. Animal foster homes can sign up too so the app can pair them with local shelters for animals that need their help. Looking for a new app? Talk to the Pulse Solutions team. We are dedicated to developing user-friendly apps for all platforms and designing a landing page for them. Contact us right away.